When it comes to foiling, most of us are aware of the dangers posed by the presence of razor-sharp wings and mast and the consequent potential for injury in a wipeout. There are very good reasons for learning to foil away from the crowds and always wearing a helmet and an impact vest. But when taking safety matters into account for foiling, have you considered eye protection? Not just for protecting your eyes against the sun’s harmful UV rays, but also for impact protection? Failing to do so, or worse still, making a poor choice, could cost you dearly. “Knowing the dangers of kite foiling I wear the protective gear for foiling like impact vest and helmet but to be honest I did not think about eye protection as I mainly wear sunglasses for the sun”. “While learning in light winds in which it would appear to be relatively safe, I fell and pushed the board over my kite lines which resulted in me being pulled towards the board when the kite powered up, I was pulled head first towards the board and while the helmet took a big impact some part of the board or foil hit my right eye”. “I was fortunate to be wearing my two-year old LiP Typhoon sunglasses. The impact was hard enough that the padded sunglasses frame cut into the side of my face close to my eye. I also had a lot of bruising right around my eye but no damage to my eye itself. I believe the frame and lenses spread the impact around my eye and saved me from direct eye damage as the impact was very hard. To come away from this with no permanent damage to my eye in some ways make you shrug off the experience as minor. But I also consider that if I had not been wearing sunglasses or had been wearing sunglasses of lower quality with no soft padding and fragile lenses that shatter, I may have suffered long term damage”. We think Alex’s story contains a strong message and we wanted to share it. With the rapid rise in foiling across most watersports disciplines, there are additional dangers to consider and eye injury is one of them. How does the Typhoon provide impact protection? At LiP Sunglasses we take your eye health seriously. Our watershades are designed for rugged use and will protect your eyes, even if they take a hammering. Here are the three main reasons Alex did not suffer an eye injury. Flexible TR90 Typhoon Frame. 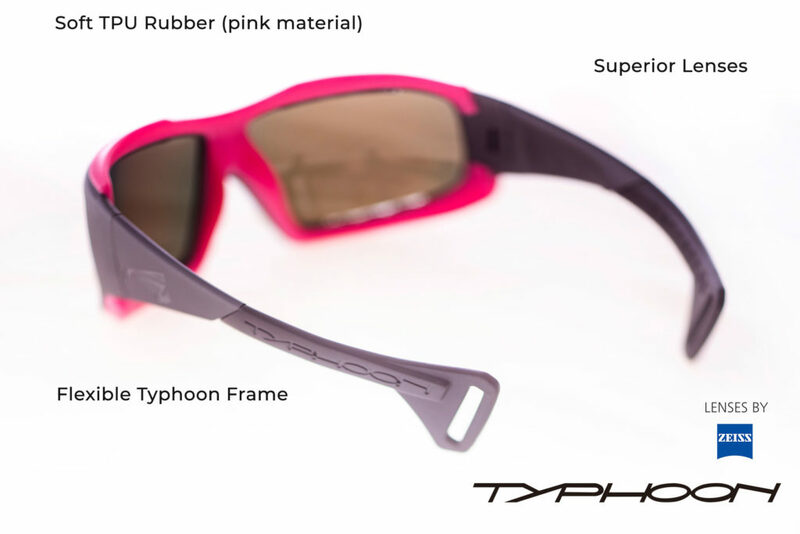 The Typhoon frame is made from Grilamid TR90, which is a nylon thermoplastic. It is a Swiss developed technology that is lightweight, flexible and incredibly strong. Its flexibility is crucial when it comes to impact protection because when TR90 is placed under significant pressure (like during a heavy wipeout), the frame will bend and flex rather than snap or break. This ability to absorb and spread the force of an impact is critical. Alex was yanked hard towards his board, and on impact, the Typhoon frame flexed and didn’t break. Soft TPU rubber. The Typhoon provides additional impact protection with the soft TPU rubber padding which surrounds the frame. While the Grilamid TR90 spreads the impact load, the TPU rubber acts like a fender to dampen the impact force. Superior Lenses. The suitability and quality of the lenses is another core consideration when it comes to impact protection. Had Alex been using unsuitable lens material like mineral glass or CR-39, the impact could have fractured / shattered the lenses into pieces. It doesn’t bear thinking about what could have happened to Alex’s right eye had that occurred. All Typhoon models ship with Zeiss lenses which are made from impact resistant polycarbonate or polyamide material. These materials are guaranteed not to fracture on impact. “I have since continued to learn to foil wearing the same LiP sunnies as they were undamaged by the impact and I consider the cost of them as irrelevant compared to the cost if I had not worn them or had lesser quality glasses. Just don’t think it will not happen to you, stay safe”.